When it comes to travel, there are few things more American than epic road trips and national parks. Americans have been hitting the open road on their family vacations for decades, and one of the most popular destinations to travel to in the United States are its many beautiful national parks. In the spirit of putting both of these pieces of American culture together, I have put together five absolutely epic national park road trips for you to take in your lifetime. In this five-part series, I am going to outline some road trips that will take you thru some of the most beautiful landscapes the United States has to offer and to some of the most stunning national parks that are in the US National Parks system. Whether you are looking for a mountain, desert, or coastal ocean experience, there is a road trip that fits your needs. From the wonders of Yellowstone National Park and the Rocky Mountains to the magnificent canyons in Utah and Arizona, all the way to the beautiful coastlines and lakes in the Pacific Northwest, we have you covered in this guide. You will start your trip by flying into Seattle, Washington, where you can spend some time exploring this beautiful city or start your road-trip right away with a stop at the beautiful Olympic National Park. Located on the Olympic Penninsula just outside of Seattle, Olympic National Park is known for the moss-covered trees in its temperature rainforests and the beautiful mountain vistas and beaches that can be found within the park. You will want to spend a full day in Olympic National Park as there is a lot to see and do. Once you have explored Olympic National Park, you will head East into the Rocky Mountains until you get to North Cascades National Park. The North Cascades is one of the prettier sections of the Rocky Mountains and North Cascades National Park lets you explore these beautiful mountains and the surrounding areas. If you into climbing and hiking, you will really enjoy this park as it is a favorite of enthusiasts of both. Having seen some of the prettier mountains in the Rockies at North Cascades National Park, you will next head South and drive until you get to Mount Rainier National Park. At 14,410 feet (or 4,392 meters), Mount Rainier is the 5th tallest mountain in the continental United States and one of the favorite mountains for climbers. Make sure you bring your hiking shoes with you as this park has some of the best hiking trails in the US National Parks System. If you think the destinations on this itinerary have been impressive so far, we are just getting warmed up. As soon as you are finished touring Mount Rainier National Park, you will continue South until you get to the infamous Mount Saint Helens. If you aren’t old enough to remember, Mount St Helens is a volcanic mountain that last erupted in 1980, covering much of the Pacific Northwest in ash and killing 57 people. Today you can see the crater that the explosive eruption created and still see where the areas that were damaged by the eruption. When you have finished touring Mount St. Helens, you will say goodbye to the state of Washington as you head South into Oregon. Your first stop in Oregon will be the beautiful Multnomah Falls, which are located just East of the city of Portland. These Multnomah Falls is one of the prettier waterfalls in the Pacific Northwest, if not the whole United States so you won’t want to miss seeing it. After touring the falls, you will head to the coast of the Pacific Ocean, where you enjoy some of the most amazing ocean views you will see in the continental United States. As you head South along the coast, I would strongly suggest checking out Cannon Beach as it is one of my favorites. Your next official stop on this itinerary will be the beautiful Heceta Head Lighthouse, which is located on the Pacific coast about three hours South of Portland. This is one of the most beautiful lighthouses in North America and is definitely worth exploring if you have the time. When you are finished exploring the lighthouse, you will turn East and begin heading inland towards the next stop on the itinerary, which is Crater Lake National Park. One of the most underrated national parks in the United States in terms of beauty, Crater Lake is one of the gems of the US National Parks System. With a depth of 1,949 feet (594 meters), it is the deepest lake in the United States and one of the deepest lakes in the world. From the deepest lake in the United States, you will next head to some of the biggest trees in the United States when you visit Redwood National and State Parks in Northern California. With trees that are so big, you can drive a car thru them, you will be absolutely astonished when you see the size and the beauty of the California Redwood trees. As soon as you are finished marveling at their height and beauty, you will head back North to Portland where you will return your rental car and catch your flight home. If you have some extra time before you leave, Portland is a pretty amazing city in its own right and is really fun to explore. The Pacific Northwest is a very large area, and with a total drive time of 34 hours, you cover a lot of ground on this road trip. For that reason, I would strongly recommend that you schedule 10 to 14 days to complete this trip. You will feel very rushed if you try and complete the trip in less than 10 days. 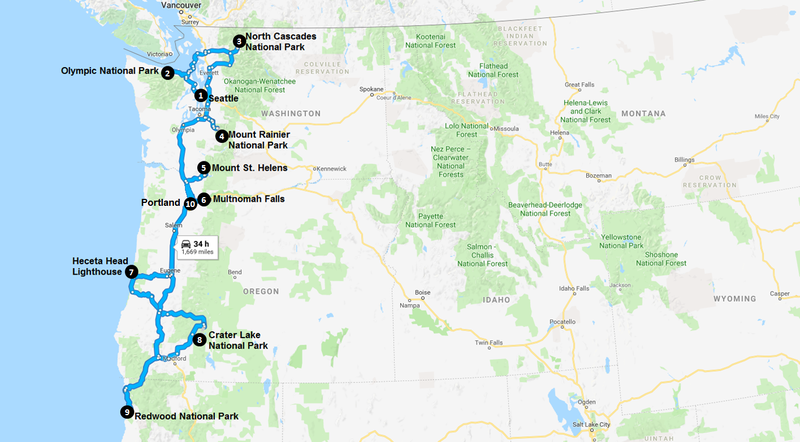 Below you will find an itinerary that I have designed for a 12-day trip thru the Pacific Northwest to some of the areas most beautiful national parks and public lands. You will begin your trip in the city of Seattle, Washington, but you will complete your trip in Portland, Oregon. So when you book your flight, you will want to make sure you select a multi-destination flight. You will want to do the same with your rental car, with a pick-up location of Seattle, but a return location of Portland. As soon as you land in Seattle, you can either take some time to explore the city or head straight for Olympic National Park to do some sightseeing. It really depends on how much time you are taking on your trip and how much time you would like to spend in Olympic National Park. The second day of your trip will be reserved exclusively for exploring Olympic National Park. Olympic is such an amazing place with such a wide variety of landscapes and habitats that you will want to make sure you see it all. The beautiful moss-covered trees in the park’s temperate rainforests are absolutely amazing and the views from on top of Hurricane Ridge are breathtaking. After you have spent the day exploring the Olympic Penninsula and Olympic National Park, you will want to head Northeast into the Rocky Mountains to North Cascades National Park. With beautiful mountain passes, crystal blue rivers, and some of the best hiking in the American Northwest, North Cascades National Park is a playground for outdoor enthusiasts. You will get to see the American Rockies at their most beautiful and have a chance to hike and\or climb in one of the most stunning landscapes in the continental United States. When you are finished checking out all of the amazing trails and viewpoints, you will need to head South to Mount Rainier National Park, which is another beautiful mountain park. Centered around one of the tallest mountains in the continental United States, Mount Rainier National Park is full of breathtaking beauty. With numerous viewpoints and miles of alpine hiking trails, you will quickly fall in love with Mount Rainier National Park. I would suggest that you spend a few days in the park exploring, especially if you would like to do an overnight hike or do some climbing. When you are finished exploring Mount Rainier National Park, you will continue heading South to Mount St. Helens. There is nothing else quite like Mount St. Helens in the United States and few places like it in the world. This large volcano last erupted in 1980 and you can still see the impact of that eruption on the landscape around the mountain to this day. With some amazing viewpoints and a learning center that teaches you exactly what happened on that fateful day when the volcano erupted, Mount St. Helens is a must-do stop on your way South. As soon as you have completed your tour of Mount St. Helens, you will head further South into the state of Oregon and then turn East when you get to Portland. Just East of Portland you will find the beautiful Multnomah Falls. If you are a fan of waterfalls, then you are going to absolutely love the Multnomah Falls, which is located just East of Portland. This beautiful, two-tier waterfall is one of the prettier waterfalls in North America. There is an observation deck that you can get to via stairs for a close-up look at the falls, so make sure you make the hike up to check that out. When you are finished enjoying the falls, you will turn West and head towards the coast of the Pacific Ocean. The first stop on the coast will be the stunning Heceta Head Lighthouse, which is located about four hours South of Portland. There are not many lighthouses in North America, if not the world, that is as pretty as the Heceta Head Lighthouse. Located on the edge of steep ocean cliffs with a beautiful forest just behind it, the Heceta Head Lighthouse is a photographer’s dream. Make sure you stop at the multiple viewpoints approaching the lighthouse so that you can get some stunning ocean shots with the lighthouse like the one I took above. After enjoying the Heceta Head Lighthouse, you will turn back inland and head East towards Crater Lake National Park. Not only is Crater Lake the deepest lake in the United States, but it is also one of the clearest lakes you will ever see. This makes it the deep blue waters of the lake look almost magical when the sunlight hits the water. Appropriately, the island in the center of Crater Lake is named Wizard Island and looks a lot like an old, abandoned sea ship stranded in the middle of the sea. There are some amazing viewpoints around the lake and some really nice hiking trails that take you around the lake and down by the water. I would suggest spending the good part of a day at the park exploring. When you are finished, you will head South into California to see Redwood National and State Parks, which is your last park stop on this road trip. The last, but certainly not the least beautiful, park stop on this itinerary is Redwood National and State Parks. This collection of national and state park lands is home to some of the biggest trees in the entire world. These behemoth Redwood trees can reach heights of over 360 feet, which makes them the tallest trees in the world. They don’t have as much girth as the Sequoia trees that are also found in California, but they do get pretty big in diameter. In fact, they can get so wide that you can drive a car thru some of them. Just outside the national parkland, you will find a tree that you can drive thru, as you can see in my picture above. What a surreal experience this is. When you are finished exploring the Redwood National and State Parks, you will head back up North to Portland to finish your trip. This is the longest stretch of driving that you will do on this trip, so make sure you leave yourself enough time to make it back without stressing. You will wrap up your trip in Portland, Oregon, where you will return your rental car and catch your flight home. If you have some extra time, I would recommend taking some time to explore the Portland area. The Columbia River area has some really scenic areas and Portland has some excellent restaurants and shopping. I would strongly recommend that you make this trip between the months of May thru October. It can be quite cold in the Pacific Northwest during the Winter months of December thru February and the early Spring months of March thru April and late Autumn month of November can be quite unpredictable in terms of weather. If you are up for outdoor winter activities like cross-country skiing or snowshoeing, then winter might be right up your alley. However, I would make sure you are prepared for cold temperatures and possibly poor road conditions. Great read, I visited a few of these last summer but some I’ll have to go back to. You definitely get better temperatures but that’s somewhat balanced out by forest fires which hit much of Washington, Oregon and California. Or certainly last summer anyway. Thank you! I 100% agree. Such a gorgeous area! Amazing post! I am planning to rent a car in San Jose and make a roadtrip across California. It is beautiful!! The moss covered trees in the temperate rainforests are breathtaking!